Just Romantic Suspense: Meaner, Harder, Stronger, Killer. Congratulations to "Martha L.", the winner in Denise's giveaway. Thank you to all who participated. I kill for a hobby. It’s epic? A lot of researching goes into writing romantic suspense and not just figuring out the what, where and who. If we want to do it right authors will spend and large amount of time researching the crimes and the criminals. The antagonist in the story is at most, as important as the hero and heroine. I am Denise Jeffries and I kill people for a hobby. My books are said to be a wild ride of romance and intrigue. I realized early on I wanted my antagonists to have as strong a goal as the hero and heroine, even though for totally different reasons. Their main goal is to piss off the reader. They certainly make me mad and I wrote them. I didn’t want them lovable. Mostly because I knew at the end of the story they would most likely be dead or in jail. However, every now and then they abandon the story because there’s room for return. Don’t we all love the suspense of the return of the bad guy? It’s what keeps us up at night. When we think about the bad guy the readers can love to hate them, hate to hate them or just hate them. If the author can succeed in this our job is done. Either way, building their character is just as important as building the scene and the characters of the protagonists. If the antagonist is weak what does that do to the story? I remember once I was researching guns and police procedure I needed to know the politics behind bullet proof vest and the cops that wore them. Were they worn 24/7 when in the field? Other than the possibility of getting killed, what was the back lash from the superiors? I was standing in a gun shop that was frequented by police officers when they were buying their guns and supplies. I’m staring into a gun case checking out different guns and a very tall, very opposing police officer walks up and stood next to me. Great op to get some questions answered, right? When I asked him if I could ask him some questions he quickly agreed, not knowing who I was or why I was there. I asked him what guns cops used. What guns did female officers use? How heavy are the vest etc, etc, etc. He answered my questions without pause and actually seemed to be enjoying himself. I then asked him did police always wear a vest. I knew exactly what I was doing. If you could have seen his expression and demeanor and how fast it changed from friendly to what the hell. It was epic! I burst out laughing, pulled out my business card and introduced myself. I explained I was researching a book and told him about my writing adventure and the work in progress. He also burst out laughing with this deep bellowing laugh. It was evident he was relieved he didn’t have to arrest me or at the least follow me around town to see what I was up to. He wrapped his arm across my shoulder, took me to the beginning of the display case and walked me through every weapon on display. We talked about police procedure as well as some of the things police do that they shouldn’t such as going into the field without a vest. Great, now I don’t have to change how my character got shot. To this day I’m so appreciative of the time he took giving me information that has played an important part in my romantic suspense. I always smile when I think about his expression and solid stance. Researching, writing and reading suspense is epic! Tyson St. Jerreau didn't believe in fate, luck or love at first sight. He believes in getting the job done. It's about the missing women and children. The girls and the boys. It’s about the case. The one thing he certainly didn't have time for was history repeating itself. Raine Jacobs doesn't believe in fate or love either or anything else that instills beliefs that life is fair and what it's supposed to be. After all, she shouldn't even be here. She's supposed to be dead. As anger builds and sparks fly, when their paths cross... again, will they be able to put the past where it belongs... in the past and allow what's building between them to blossom or will the lies separate them forever. Denise will be giving away a copy of SAINT'S BAYOU to one person leaving a comment or email entry. Giveaway ends 11:59pm EST Aug 28th. Please supply your email in the post. You may use spaces or full text for security. (ex. jsmith at gmail dot com) If you do not wish to supply your email, or have trouble posting, please email maureen@justromanticsuspense.com with a subject title of JRS GIVEAWAY to be entered in the current giveaway. I love romantic suspense, I have to catch up with your books. Thanks Carol. I hope you enjoy. I would have loved to have seen the expression on the Police Officer's face. What a great opportunity for you. It was great. I still smile when I think about it. 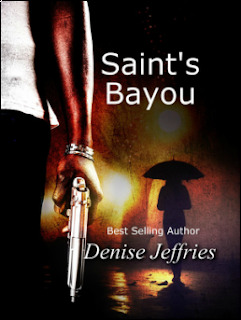 I must say that the synopsis of Saint's Bayou really has me wanting to read it! Tyson sounds like a hard worker who wants to solve the case and, therefore, help the people needing him. And Raine is suppose to be dead! I've just got to find out about that. When I went to New Orleans I met so many people who went back after Katrina to help rebuild. they inspired his character. what luck that you had such a great and fun source!!! This looks and sounds fabulous! Thanks for sharing! Thanks for joining us today. Keep in touch. Thank you so much. Continue reading. It is greatly appreciated. Wow! the book sounds awesome. Looking forward to reading this one. Awesome. Keep in touch and let me know what you think. Enjoy! Most professionals are happy to help someone who is truly interested in what they do and has a valid reason for their questions. I appreciate it greatly when an author takes the time to research well before writing their story. Nothing pulls me out of a story faster than a piece if misinformation or something that just doesn't fit.